I am not sure of the reasons behind why they made this, but is a pretty good scope for audio applications. As usual, I have been fantasizing about one of these fellas for a while and I found one fits my need – Broken and no life. So as always, no thinking, just go and get it. and its in my lab for repair ! Unlike the other scope I ended up having, this one was really neat and clean, both inside and outside. One knob was broken, which I could find in a flea market for 25cents, (ebay is 25$ for same), and another broken knob is fixed with glue. General cleaning on the knob, I posted the pics of this beauty directly to Tek Wiki, you can refer the link above. 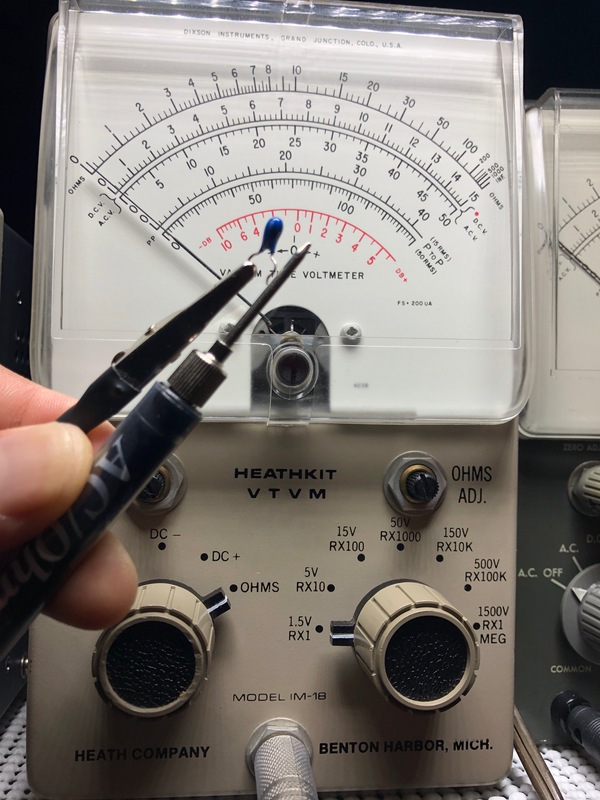 Warning: This is relatively a low voltage instrument, with Maximum rail DC @ 200v, which is less dangerous compared to vacuum tube scopes, but it is deadly. The HV/Deflection board contains 3500V DC. Do not attempt to repair/open unless you are really qualified to do so, and know what you are getting in to. There are better ways to die if you are up to that. First power up, no signs of life. I got it with 5A19N Vertical Plug-in and 5B10N Timebase or Horizontal Plugin. First step, pull the plugins out, and press the Beam finder, I do have a dot in the middle. Intensity control is working, so do Focus, so the culprit is one of the plug-ins. Tried inserting one by one and found the 5A19N as the culprit. Its loading the scope that once I insert 5A19N Vertical Plug-in whole scope is dead. Check Tek Wiki – http://w140.com/tekwiki/wiki/5A19N for details of this plug-in. You can pull the Aluminum cover off the plugin to get inside it and here is the view. Okay, this is mostly easy, I see Tantalum caps inside, and one of them has to be short. As I expected, it was and here is the culprit. Confirmed it in the schematic, it was short circuiting the 30V rail. removed and confirmed it, off the circuit with VTVM. I specifically used VTVM to confuse you in case you are not familiar with the Ohms reading in a VTVM ;). Left is where the shorted cap is across terminals, right is ohms reading with nothing connected to probes, reading infinity. if you look at the schematic, you can find many more tantalum caps across power rail for Decoupling/Filtering . Since anyways I am in, better replace all. And reassembled the Plug-in, inserted it and the scope is back to life. But, trace is weird !! Intensity modulation ? Plus weird noise from the HV Transformer. Something like a rattle snake is inside scope! Checked every component inside the scope boards, tried working plug-ins from my 5441, and even tried replacing the only Chip, a 7401 suspecting its an issue with unblanking. All voltages looks normal, except the Unblanking side towards HV. I removed the A1 HV/Deflection Board from the unit to troubleshoot further. All components including resistors, transistors, diodes and caps tested good. Inserted it back and No trace at all !! Spend a very good week on it, could not find any component which is at fault. 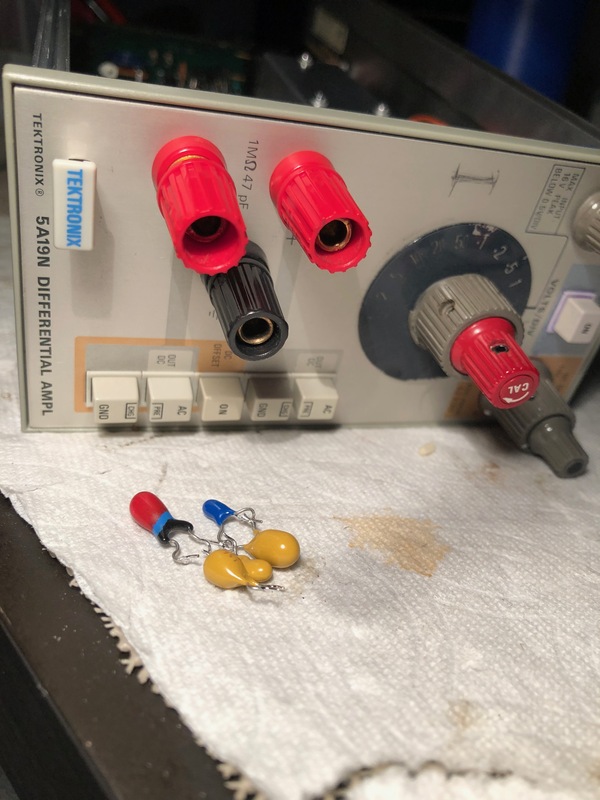 Finally tried the good old trick, pushing/flexing the PCB, and there you go, I do get trace for a second when I knock or flex the PCB by pushing it down, near HV transformer. No more troubleshooting, removed the board, re-soldered all points on HV Side on the HV/Deflection board and put it back and here you go !! Ran it for 3 hours, again the same problem. Trace goes blank, I hear the rattle snake inside HV Transformer again ! Decided to monitor the HV out and deflection input. Here is the HV Probe and V7A with 100X HV Probe. Low voltage probe is monitoring primary of deflection transformer. this is 100X Probe, so on 50V range its recording ~ 3500V. Now to test it, I started poking around the board again with a wooden brush handle. Caught the second problem. Dry solder again. When I press around the Filament Connector side of the board. Its bringing down the HV to 2800V. and deflection transformer becomes rattle snake. These are the areas in the below pic I identified with dry solder joints. May be mechanical stress around the board and mounting is causing this with help from the heat expansion. The section in purple is where I had dry solder . Re soldered all the suspected areas and it now works fine, even after a 8 hour burn in. Vertical and Horiz output transistor pin/traces are too close. They are running @ 200v DC, even if there is slight debris/Flux around it, it will arc. Ensure these points are clean and there are no solder bridges in case you soldered around there. CRT Heater is lifted to ~3.500Volts Be careful. DO NOT POKE AROUND HERE With LV Probes/Instruments. Single Beam Board -> There is no Key on the board to the slot. Ensure you remove and insert it same way, I didn’t confirm if it works either way. 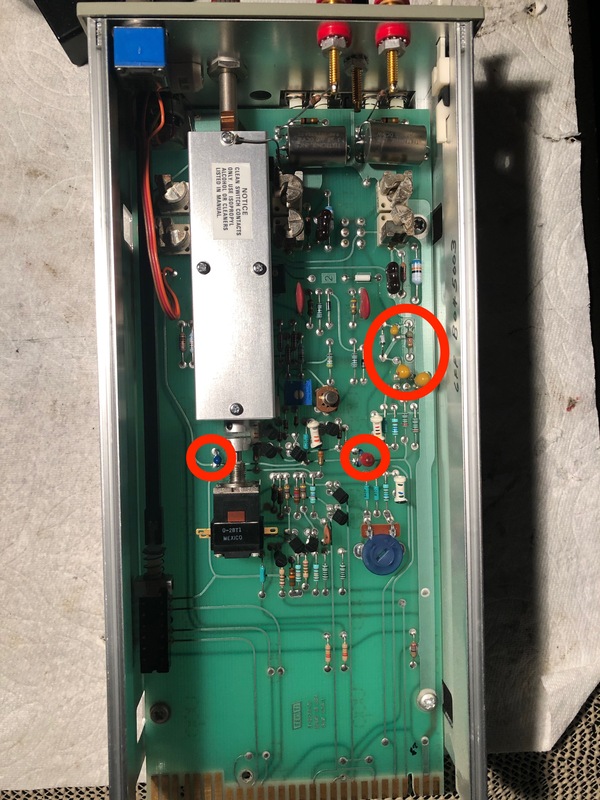 LV Power Supply – The board I had in the scope was different from the service manual one. Many more fuses. May be a different rev. Take a note of this if you are troubleshooting Power Supply. What is the practical use of this plug-in ? Any situation where you have a low level Differential ac signal riding on high DC level. There is no ground reference for signal. Example, DC level is 100V on the two lines carrying ac signal where the ac signal is at 300mV between them. 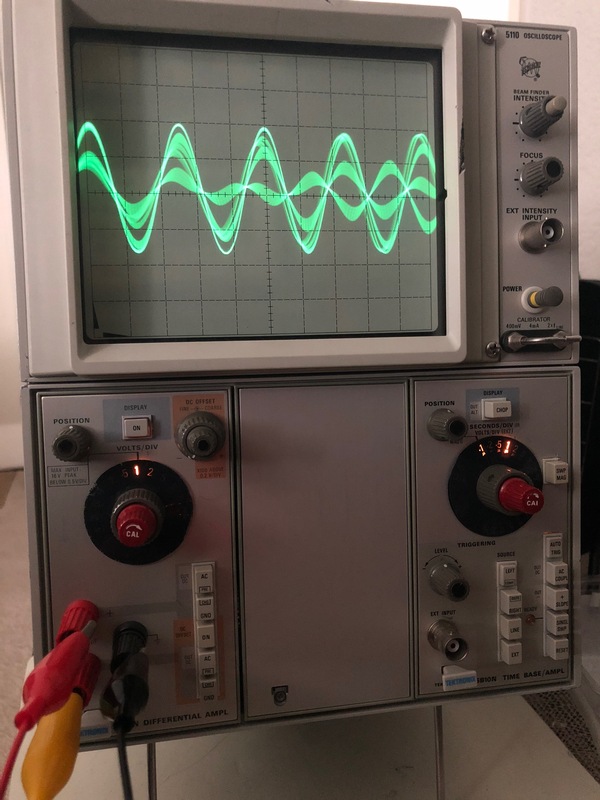 So you can not use a normal oscilloscope input between these two as both lines of the signal is at DC 100V. If you do, you will short circuit one 100V line of the differential signal, as input of the scope is grounded. You can google for oscilloscope grounding for details. Now, where do you find such signals, well, you can find them in DC coupled signal processing circuits, Lets look at a practical example which I come across often. Trigger section in Tek oscilloscopes.Even H-Amp or V-AMP as most sections are or have differential stages. Look at the blue section of the following diagram. Input DC level is 103V. Actual signal is from 103V to 103.6V. or 600mV signal. Both Q34 and Q44 Base is at 103V DC and the 600mV signal is between them. 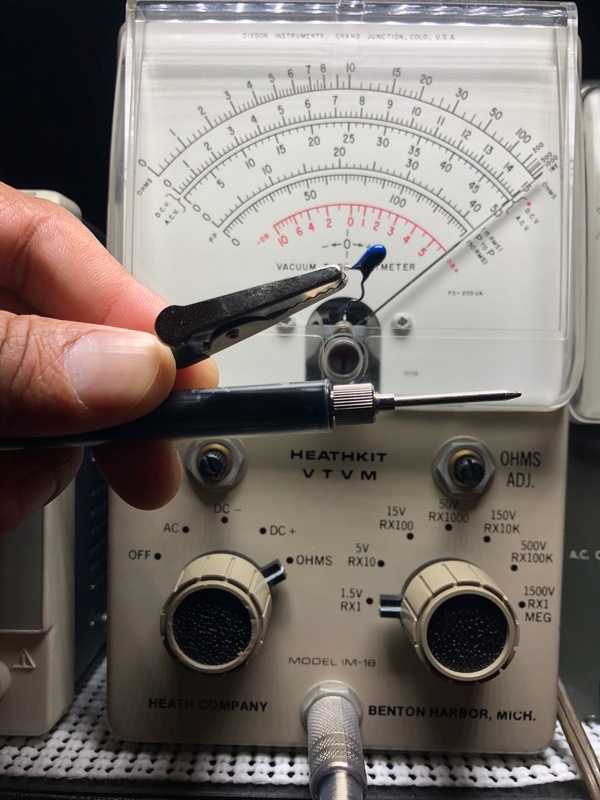 If you connect an oscilloscope pins between them, the shield/ground of scope input will short circuit one of 103v to ground. Rather you differential input plug-ins to the base of Q34/44 to see the signal. Further down, this signal is available at collector of Q34 and Q44, again at 102V DC but differential signal level is only .3V or 300mV. The D45 is a tunnel Diode, so in case you want to see what is happening across the tunnel diode, you will plug the differential input pins across D45. What is the modern equivalent ? use Dual input/trace Oscilloscope and change the signal mode to Subtract between both channels, so that you can see the actual differential signal between both inputs. Or Use Differential Probes, which does the job for you with Single channel scopes. Posted in Electronics, Speaker, AudioTagged Oscilloscope, Tek 5110, Tek 5110 Repair, Tek 5A19 Repair, Tektronix 5110 Oscillioscope, Tektronix 5A19N, Tektronix Plug-in, Tektronix Plug-in Repair, Tektronix RepairBookmark the permalink.